If you’re looking for our Best Sleep Mask reviews, you’re in the right place! On this page you’ll find our comprehensive buyers’ guide to choosing the right sleep mask for your own specific needs, as well as our top ten eye mask recommendations for 2018 – including our experts’ number one sleep mask pick: the NapForm Eye Mask. UPDATE: We have recently updated this page to include some of the newest and most popular sleep masks to hit the market. While many of our original picks are still our top recommendations, we’ve added a few new and redesigned sleep masks to ensure you’re getting the best possible eye mask for your unique and individual sleeping needs. Do you have a hard time sleeping? Do you find that even the slightest bit of light makes it far more difficult for you to fall asleep? Do the first rays of sunlight have you awake early in the morning at the break of dawn? If you can answer ‘yes’ to any of these questions, investing in an affordable sleep mask could very well provide the relief that you’re looking for. Sleep masks – also referred to as eye masks – work by completely blocking out light while you’re wearing them. Because of how effectively they keep the light out, eye masks can be great solutions for catching a little shut-eye regardless of whether it’s day or night. In fact, many business people wear sleep masks while traveling to get well rested up during flights and train travel. But most of all, eye masks are great for helping you fall asleep in the evening, and stay asleep until it’s time for you to wake up the next day – no more staying awake all night long or being woken up at the crack of dawn. With so many different night masks out there, it can be difficult for the normal person to sort through all of the sub-quality ones to find the brands and models that really stand out. To make that job a little bit easier for you, we’ve put together a list of the top three expert-recommended best eye masks for sleeping. Comfortable and effective, the NapForm Eye Mask is made out of BioSense memory foam for the most natural and relaxing fit possible. The NapForm Eye Mask by Brookstone is great because of how well it blocks out light. Once you have it on and adjusted to fit your head, you could open your eyes underneath it and still see nothing but pitch black. Perfect for both home use and travel, this mask provides quality soothing relief for exhausted eyes. The only real downside of the NapForm Eye Mask with BioSense memory foam that we’ve found is that it can’t be machine washed; all cleaning needs to be done by hand or else you risk your sleep mask losing its elasticity and fit. Great as both a light-blocker and a rejuvenation mask, the Sleep Fountain 100% Pure Mulberry Silk Mask delivers the utmost in comfort, quality, and refreshment. Thanks to its copper-infused fabric, the Sleep Fountain eye mask helps to soften your skin, lessen wrinkles, and reduce dark eye circles. As with all of the products on our top three best sleep mask list, this eye mask completely blocks out all light thanks to its large, oversized design. Conversely, while it is still a great eye cover for travel, many people prefer to use it at home because of its larger size. Lastly, and perhaps most important for many buyers, the Sleep Fountain mask is made out of 100% pure Mulberry silk – one of the finest and softest types of silk that you can buy. That equates into a mask that is one of the most comfortable on the market – especially if you have sensitive skin. Handcrafted out of cotton for a breathable, lightweight design, the Cotton Sleep Eye Mask by Mavogel is a great choice for anyone looking for nearly 100% light blockage and comfort. Thanks to its oversized build and soft cotton exterior, the Cotton Sleep Eye Mask by Mavogel has a wide coverage area to prevent light from leaking in when you move. 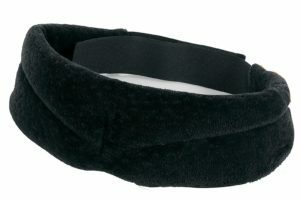 It also has an adjustable elastic strap to ensure a snug fit which won’t loosen as you sleep. This mask also comes build in with light-blocking padding that can work further to ensure both maximum comfort and light-blocking functionality. It’s also designed to fit well with earplugs for maximum noise reduction. For this reason, the Cotton Sleep Eye Mask by Mavogel is our number one pick for a travel mask. 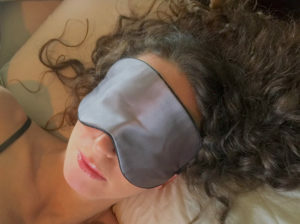 In case you’re interested in seeing a few of the other good sleep masks that are out there, we put together another list of seven more eye masks that may not have made the cut as a contender for the title of best sleep mask, but are still quality enough in our experts’ opinions to be considered honorable mentions. This high quality sleep mask comes from one of the most trusted names in nighttime comfort – Tempur-Pedic – and combines their leading form-fitting Tempur material with a design and fit that rivals the best sleep mask on the market. With the Tempur-Pedic Sleep Mask, you can rest assured that you’re setting yourself up to get a good night’s sleep, every single time you lie down. Great for buyers with sensitive skin, the Tempur-Pedic Sleep Mask’s exterior is crafted from a velvet-like material, meaning no uncomfortable pressure on your face, and no waking up in the middle of the night sweating from a lower-quality mask that retains too much heat. 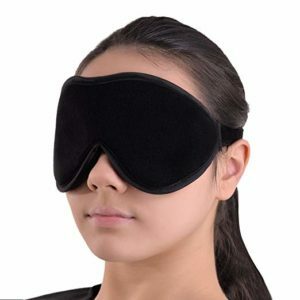 This sleep mask fits snugly on your face, preventing light from entering, while still managing to rest gently on your ears for comfortable all-night use. while the Tempur-Pedic Sleep Mask is the most expensive of the sleep mask reviews on our sleep, it also brings some along some of the highest quality craftsmanship and the backing of one of the best sleep related brands out there. Another countered night mask that leaves extra room for your eyes and eyelashes, the Jersey Slumber 100% Silk Sleep Mask is crafted out of a high-density dream weave cloth for maximum comfort and fit. 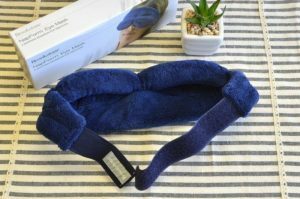 Because of its light design and comfortable feel, the Jersey Slumber 100% Silk Sleep Mask is a top pick for buyers who suffer from migraines and need a soft-yet-effective way to block out headache-inducing light. Like some of the other ultra-lightweight sleep masks on our list, the Jersey Slumber 100% Silk Sleep Mask is great for users who shift around a lot while sleeping as its simple and minimalist design helps it stay in place, working well for every nap position. An oversized eye cover made out of ultra-soft silk, the Allwaii Silk Sleeping Eye Mask is a great pick for anyone with sensitive skin on a budget. While it may not be up to the par of other high-end sleep masks like the Sleep Fountain, the Allwaii Silk Sleeping Eye Mask still offers tremendous value for the money. This mask is fully breathable, making it great for summer usage. Where other masks can retain heat and become uncomfortable, the interlocked silk design of this product makes it a smart choice in hotter environments and sleeping situations. Another great contoured option for buyers who have sensitivity to the way that traditional masks rest on the eyes, the Sleep Mask by Bedtime Bliss provide full light blockage at a very reasonable price. Because of its large size, the Sleep Mask by Bedtime Bliss eye cover is the most ideal for back sleepers. Side sleepers, or those who move around a lot, might find the bulkiness of this eye cover a little uncomfortable. That said, it is also a great mask for travel where you’ll be sitting up or in a gently reclined position. 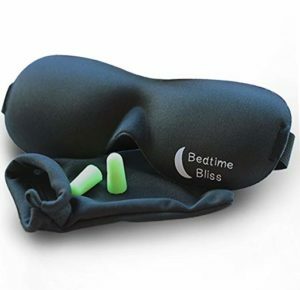 As an added bonus for the traveling user, the Sleep Mask by Bedtime Bliss comes shipped with a convenient travel bag and high-density Moldex foam earplugs for the best traveling sleep experience possible. The Dream Essentials Sweet Dreams Lightweight Contoured Sleep Mask provides mid-to-high level quality while being one of the lowest priced masks on our list. Constructed out of a soft, form-fitting poly-foam material, the Dream Essentials blindfold cover provides a snug, light-block fit, without the constraints of other lower-end masks in this price class. The biggest downside of this contoured mask is the fact that it has a tendency to dislodge and move around on sleepers who tend to become restless during the night. Still, it’s a good choice for back and side sleepers, as well as travelers. 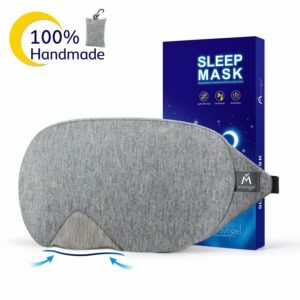 If you’re looking for a high-end sleep mask at mid-range prices, you may want to give the SleepTight Sleep Mask by G7 a closer look. Thanks to its oversized design and soft, cushiony fabric, the G7 SleepTight Sleep Mask provides a high level of comfort on your cheeks and eyes while maintaining complete light blockage – even if you move around a lot while you sleep. As a bonus, it also comes with a set of comfortable ear plugs for maximum sleep assistance both at night and while traveling. Another bonus feature of the SleepTight Eye Mask is that while some other high-end masks – especially those made out of more fragile materials – have to be hand-washed, this mask can go right in the washing machine with your darker laundry. A break from many of the oversized masks on our list, the Purple Eye Mask by Drift to Sleep offers a much more compact, contoured shape. Great for back sleepers because of its total light blockage, the Purple Eye Mask by Drift to Sleep may be less than ideal for side sleepers because of the protruding shape of the contoured foam border. This mask is billed as being an ideal fit for use during yoga and other types of similar relaxation exercises thanks to its compact, lightweight, and light-blocking properties. Because of its soft foam construction, this Drift to Sleep mask works well for anyone who hates the feeling of pressure that some other heavier products can leave on their face during the night. While some people may try to tell you that eye masks are basically all the same, this couldn’t be further from the truth. They can vary greatly by a number of different characteristics, with each product providing its own unique set of advantages and disadvantages. The core function of any eye mask is to block light, but you’d probably be surprised to find out how many different masks simply fail when it comes to keeping light out. Whether it’s because of a poorly designed shape or a thin, see-through material, sleeping masks which aren’t completely light blocking should be automatically crossed off your list. Sleep masks come crafted out of a variety of different materials ranging from cloth and silk to memory foam and foam composite. The best sleep mask material is going to vary from wearer to wearer, but as a general rule of thumb silk and memory foam masks are typically superior to the less padded and more abrasive cloth alternatives. Not everyone is going to have the same shaped eyes, and for some people, the standard flat night masks can cause noticeable pressure on their eyelids which makes it even harder to fall asleep. 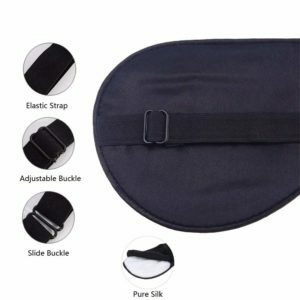 As a result, many purchasers opt to go with an eye mask with a recessed cavity to ensure optimal comfort. 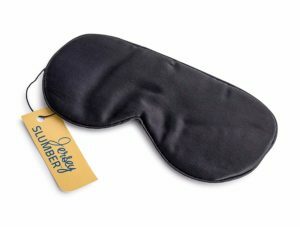 The downside of a contoured eye mask with a recessed cavity is that it can be seen as bulky for side sleepers, and may be dislodged by anyone who moves around a lot during the night. Just like everyone’s eyes are going to be different, so are the shapes their heads. The best sleep masks won’t be completely one-size-fits-all. Instead, you should look for ones which offer a customizable fit, such as a Velcro or flexible strap, and extra light-blocking flaps in needed spots. Although there are some great fixed-fit sleep masks, many lower quality items which don’t provide a customizable fit option are likely to shift and become uncomfortable while sleeping – especially if you tend to move around a bit during your slumber. Not only can this make sleeping less enjoyable, but it can also cause the masks to allow extra light in, further disrupting your sleep cycle. Nobody likes to try and sleep when sunlight (or even artificial light) is shining right on their faces, but some people are far more sensitive to exposure to light than others. For these individuals, wearing a sleep mask allows them to take better control of their sleep schedule instead of subjecting them to being woken up first thing in the morning as soon as light beings to seep into the bedroom. This can be especially important for wearers who sleep non-traditional hours, such as late-night or third-shift workers who often find themselves trying to get some shut-eye during the middle of the day. In this sort of situation, a quality sleep mask can mean the difference between low-quality and high-quality rest. Attempting to sleep while traveling – whether on a plane, train, or bus – can be one of the most challenging settings for most people to maintain quality sleep. There are no shortage of distractions that will prevent you from getting quality rest outside of the comfort of your own bed and bedroom. Thankfully, a quality eye mask and a pair of high-density foam earplugs can be a true blessing for your sleep cycle, allowing you to ignore external lights and noises and maintain rejuvenating REM sleep – especially in otherwise hostile sleeping environments. If you’re reading this guide, you already know exactly what getting a poor night’s sleep can do to your memory and concentration. That’s because our bodies and minds need to be fully rested in order to perform at their peak. By using a sleep mask to improve your sleep cycles, you can in turn improve your ability to create and recall memories, as well as enhance your cognitive function – your ability to understand and process complex questions, situations, and problems. While this is important for nearly all of us, ensuring a good night’s sleep through the use of aids such as a sleep mask and noise-blocking earplugs is of the utmost importance for anyone required to perform at high cognitive levels during the day. This is never truer than for individuals who engage in potentially dangerous tasks on the job such as long-distance drivers and those who operate heavy machinery and production equipment. Research has shown that people who maintain a proper and consistent sleep schedule are far more likely to suffer from high stress and anxiety. This is because rest is one of our body’s strongest natural defense mechanisms against mental health issues. Quality sleep helps maximize our psychological regenerative functions and serve to make our brain far more able to adapt to difficult and stressful situations. Research by Stanford University has shown that in clinically depressed people who suffer from insomnia, a proper sleep regiment doubled the likelihood of successful treatment for their depression. That is no coincidence, and for many people the use of a quality sleep mask can be a major step in the right direction towards getting a sound night of sleep, night after night. If you’re looking for the best sleep mask for both falling and staying asleep, you won’t go wrong with any of the ten masks we’ve reviewed here in this article. Based on our tests and research here at Respectable Reviews, however, we feel confident in saying that our top recommendations for 2018 are the NapForm Eye Mask with BioSense Memory Foam by Brookstone, the Sleep Fountain 100% Pure Mulberry Silk Mask, and the Cotton Sleep Eye Mask by Mavogel. Thanks for reading through our guide; we hope it was a lot of help in finding the perfect sleep mask. Here’s to getting a good night’s sleep!